Now that war is declared - and battle come down! London Calling! Lisa here with an update that&apos;s right up my alley since I am moderately obsessed with London! The Hard Rock Cafe Tampa held it&apos;s battle of the bands on March 3rd. The hometown favorite, Seven Years Past (check out the bands homepage and listen to some of their music!) took home the grand prize # 1 spot. Not only does that mean that they will get a gig at the Hard Rock Cafe plus a little cash, and a complimentary stay at the Casino, but it also means they are in the running for something so much bigger. Early next month judges will select 10 groups from four international regions for the next phase of this battle (there will be 40 total winners). 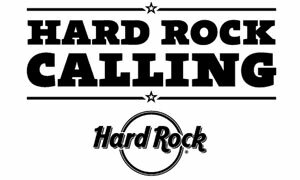 The four bands with the most votes after an online public voting round will win a chance to open this June for Bon Jovi at Hard Rock Calling 2011 in London&apos;s Hyde Park! The online voting will take place from April 12-25 at www.hardrock.com. The top four winners will be flown to London where they have the chance to open for Bon Jovi. The final winner will be chosen by a final worldwide fan vote from April 29-May 5. Hard Rock Calling 2011 is a three-day music festival being held from Friday, June 24 - Sunday, June 26th in London&apos;s famous Hyde Park. It has been called one of the most important London events on the UK musical calendar. With Hard Rock Hotels and Casinos in 52 countries it is one of the worlds most recognizable brands with one of the most extensive music-related merchandise collections around. It would be a great honor to have one of our own performing in London. A big congratulations to the band Seven Years Past for their win! Well that&apos;s all for me, but check in soon for more Tampa Florida News Updates, and other Tampa Bay Area Events!